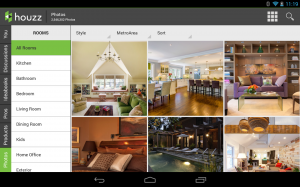 Houzz Interior Design Ideas is an application that jumped to Android after a big success with iOS devices. This is an incredible database with all the current trends in decoration. The application features more than two million high-resolution images, which include most of the well known brands as well as more original ones. 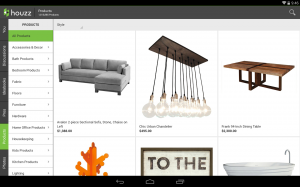 If you are looking for ideas to redecorate your house, Houzz Interior Design Ideas is your app. Here we can find photos sorted by style, room and location. It also offers the opportunity to search for specific thematic design. You can slowly create your custom photo collection and share them on social networks. Another practical aspect that Houzz Interior Design Ideas offers is the ability to find the price of the products and materials that catch our attention, as well as providing all kinds of information about the best architects, designers and other professionals. So it is not just a simply a collection of images, but it also provides all the information of the products that appear in them, such as the price of items that can interest us and shops where you can buy them, the names of the designers and architects who have worked on the project and how to contact them, etc. The application has expanded to the point that many professionals use it to present their proposals. Architects and designers who want to spread their market can upload images and the people can vote, comment, and share their work. Houzz was founded by Alon Cohen and Adi Tatarko in February 2009, when they created a database of images online for people who were moving or redecorating their homes. In November 2010 came the first app for iPad, while the Android version arrived in December 2012. The app is free for iOS and Android users. You can find it in the App Store and Google Play respectively.